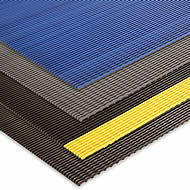 No Trax 531 Safety Grid has a welded duckboard design that creates an elevated platform for safety and keeps traffic away from moisture making it the perfect choice for locker rooms, showers, bathing and pool areas. Industrial gade PVC vinyl compound resists chemicals, while providing an anti-slip surface and basic fatigue relief. Top of rails features a saw-tooth design for added traction. Mat runner can be cut to your desired sizes. 3 sizes to choose from 2ft x 40ft, 3ft x 40ft or 4ft x 40ft. 4 colors to choose from Black, Black/Yellow, Blue or Grey.